SSL Certificates were created to validate the genuineness of a web site because it is so easy to counterfeit a business on the web. In 1995, when they were invented, a standard SSL Certificate provided adequate protection for consumers. Times have changed; web scams became more sophisticated and these traditional certificates may no longer be adequate. A member of the general public can easily forget to look for the small lock icon in the browser window and they won’t necessarily recognize a fraudulent use of an SSL Certificate. Sophisticated web scammers easily fool some less stringent CA identity authentication practices and some web fraud sites simply use self-signed SSL Certificates that provide no identity authentication at all. The general public often cannot recognize when they are presented with one of these questionable certificates. This is one reason why spoofing schemes such as phishing and pharming have become so prevalent and successful. The Extended Validation SSL standard helps solve both the problem of low SSL protection visibility and low assurance of a site’s genuine identity. The CA/Browser Forum, comprised of over twenty browser manufacturers, CAs, and WebTrust auditors along with the American Bar Association Information Security Committee (ABA-ISC), worked for more than a year to create the first inception of the EV authentication process. The CA/Browser Forum continues to develop the EV standard and guidelines in order to improve Internet security and combat online fraud. The EV guidelines describe a set of standardized best practices that must be followed in order for an SSL Certificate to meet the requirements for Extended Validation status. Any CA who wants to issue EV SSL Certificates must first pass an independent WebTrust audit confirming their use of the EV identity authentication standard practices. The rigorous EV authentication process described in these guidelines relies on business verification practices proven to be effective for authenticating millions of SSL Certificates. An EV SSL Certificate functions the same as a traditional SSL Certificate for older browsers that do not recognize EV, such as Internet Explorer 6, Firefox 2.0, and earlier versions of both. For new high-security browsers, such as Internet Explorer 7 (IE7), EV offers significantly more benefits than a traditional SSL Certificate. To the end user, these newer browsers display an EV SSL authenticated session in a far more visible and informative way than the small lock icon at the bottom of the page shown for many traditional SSL sessions. EV contains a number of user interface enhancements aimed at making the identification of an authenticated site immediately noticeable to the end user. IE7 is the first browser to deliver these benefits: by default with Windows Vista and with an easily prompted update for Windows XP. The most obvious interface enhancement is the green address bar effect; when an EV-enabled client visits an EV authenticated site the address bar turns a highly visible green color. This conspicuous color change immediately notifies the end user that this web site passed a rigorous authentication process. Green is also a highly effectual color – to most people green means go, it is safe to move forward. In addition to the green address bar effect, a security status bar appears to the right of the address bar. This field, also green, displays the name of the organisation responsible for the web site and toggles to identify the CA that authenticated the web site. In the example above, the name of Woodgrove Bank displays in the security status bar field and automatically toggles to the name of the CA (in this case thawte). The EV SSL Certificate provides the source for the names in these fields, confirming that the CA has verified this information. Therefore the end user can depend on it being accurate. This interface convention makes it easier for customers to notice the name of the CA. This new higher visibility to customers should motivate web sites to obtain their certificates from only the most reputable CAs. If a customer is not familiar with the CA, they most likely won’t trust the web site being certified. These interface enhancements, difficult to counterfeit by phishers and pharmers, create a new level of protection for web site visitors. If a spoof site buys a traditional SSL Certificate it would not display the highly trusted green address bar and even if they bought an EV SSL Certificate to gain the green address bar, it still would not be able to display the name of the organisation they were attempting to spoof in the security status bar. Either the Online Certificate Status Protocol (OCSP) function or Phishing Filter within IE7 must be enabled for a client to see the powerful EV interface enhancements. The OCSP allows a browser to perform a real-time validity verification of an SSL Certificate. This real time check, part of the high level identity authentication aspect of EV, makes sure this certificate has not been revoked. Newer browsers typically support OCSP but this feature may be manually disabled. The Phishing Filter in IE7 adds functionality in addition to enabling the EV green address bar and security status bar interface. With the Phishing Filter enabled, an end user’s address bar turns yellow or red when the user visits sites that IE7 identifies as suspicious. 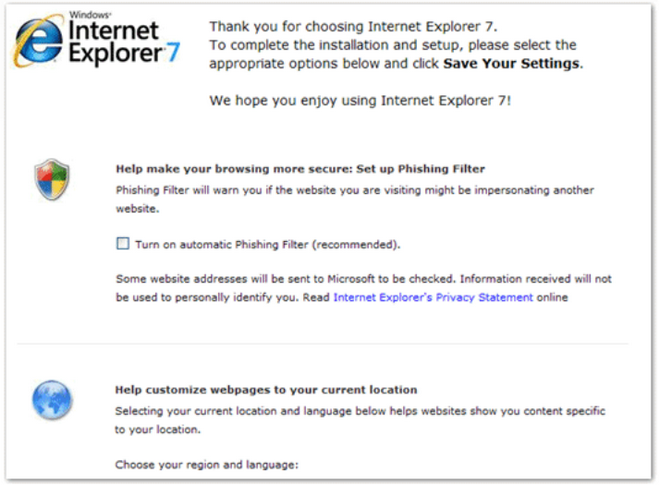 IE7 recommends the user activate the Phishing Filter during installation and the Phishing Filter automatically enables OCSP. Building a system to help end users make better decisions about who to trust on the web required the CA/Browser forum to modify almost every component of the trust infrastructure for the web. The EV standard encompasses far more than just a new user interface, although the new user interface will symbolize to end users the significance of the rest of the work performed. EV SSL Certificates base their strength on specific identity authentication process requirements and real-time certificate validity verification. The CA/Browser Forum spent more than a year developing identity authentication guidelines for EV that would be reasonable to follow and would help produce reliable results. To read the first implementation of these official EV authentication guidelines, visit the CA/Browser Forum web site at www.cabforum.org. EV guidelines require all identity information from certificate requestors be supplied by authenticated third parties or come directly from primary sources. The requesting organisation cannot verify its own identity. This requirement makes sure the identity information being authenticated is correct. The authority of the person requesting the EV Certificate is also verified. Additionally, all CAs issuing EV SSL Certificates must pass an annual WebTrust audit confirming that they are diligently following all the EV authentication guidelines. 5. organisational contact’s employment status and authorization to purchase EV SSL on behalf of the organisation. Security measures in every EV Certificate helps ensure the integrity of the certificate. A secure hash embedded in every certificate helps protect against hacking. If the content of an EV Certificate is altered, this hash assures that the certificate will be disabled. The validity of every EV Certificate is checked in real-time through both the OCSP infrastructure and the Microsoft Root Store. The OCSP makes a real-time inquiry to see if a certificate has been revoked for any reason. In addition to the OCSP inquiry, IE7 browsers check with the Microsoft Root Store in real-time to verify that the EV Certificate matches an SSL root approved for EV. This check verifies that the CA issuing the certificate is authorized to issue EV Certificates and has not had their status revoked or suspended for any reason. IE7 clients on Windows Vista systems automatically display the EV green address bar and security status bar interface features. However, IE7 clients on Windows XP may need prompting to update their local root store before they get the new EV interface benefits. thawte solves this problem by providing all EV SSL customers with EV Upgrader™, a method for prompting the automatic update for IE7 on Windows XP clients. This update triggers a normal Windows XP function and should be invisible to the end user. After these clients have visited a site with EV Upgrader from thawte, they will display the EV interface conventions whenever they visit a web site protected with an EV SSL Certificate from thawte. In most cases the new features appear the next time the client refreshes the currently viewed web page or clicks the next EV SSL protected page. Installing EV Upgrader is very easy. thawte embeds EV Upgrader in the thawte Trusted Site® Seal. Simply put a site seal on your web page and every IE7 with Windows XP client that visits that page will be updated to show the green address bar effect and security status bar whenever they visit a web site protected by an EV SSL Certificate from thawte.